I use Vimeo.com for hosting videos although I feel out of place as Vimeo has so many extremely talented videomakers uploading absolutely magical videos. Have a look at my ‘likes’ on Vimeo and you shall see some amazing stunning work by people like Tom @ Timescapes and Mike Fletcher. The first of my video editing attempts but definitely not the last. Now that I have experienced how much fun video shooting and editing is I wish I had shot a lot more on my previous trip and will surely shoot a lot on upcoming adventures! It is fun! It is an incredible amount of fun to be a still photographer and suddenly finding yourself shooting video on your still camera! I loved it! Can’t do both simultaneously. Video shooting is incredibly time consuming and it is hard to try and do landscape photography at the same time. The firmware allowing complete manual control of video shooting had just been released and I installed it on day 2 of shooting. It is absolutely essential, giving you complete control of exposure and aperture during video shooting. Mounted on a great Sachtler tripod with a fluid head you forget it’s a still camera. The 5D Mk II becomes a video camera – but a good video tripod is essential for any sort of shooting and panning. The 5D is really terrible to handhold while shooting video, impossible to keep steady. We were a bit perplexed at first trying to get footage from the 5D to co-exist in Final Cut with footage from the JVC. The 5D footage kept skipping. 5D shoots at 30 frames, cannot be changed, JVC shoots at 25 or 50 frames. We ended up using MPEG streamclip to convert all 5D footage to 25 frames and that solved the problem. There are rumours of an upcoming firmware for the 5D allowing us to shoot at 24 and 25fps also – highly needed! Internal microphone is useless and the mini-jack microphone line input probably not a lot better. You really need a separate recorder I think. We actually recorded the audio on the JVC as that had XLR inputs and a headphone monitoring option, essential. Shallow DOF created by 35mm sensor and shooting at f/4.0 is amazing on video! We shot some awesome close ups and over the shoulder shots. High iso rocks! We shot indoors in offices, blinds closed, just a tiny spotlight and got beautiful results. Shooting video eats the battery quickly as is to be expected and I only had one battery, this was back when Canon could not produce batteries. Re-charging at every chance possible was essential. I can’t show the footage so you will just have to take my word for it – video on a 5D shot at 17mm from the back of a jeep driving through a palm plantation looks mindblowing! 17mm looks amazing on video as well as stills. Oh one final tip, mostly for myself, try not to walk into tripod while you shoot (something I did several times)! Perhaps inspired by my recent CAKE09 tale from Marble Bar, perhaps the reason is something else entirely (really who needs a reason to promote the hottest town in Australia!) 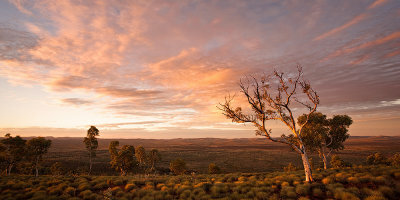 – Western Australian photographers David Bettini and Merv French have declared this Wednesday Marble Bar promotion day and asked me to join in the fun! Fellow CAKE09 members and Australia photographers Casey Smith and Rod Thomas are also part of our Marble Bar is Hot day! 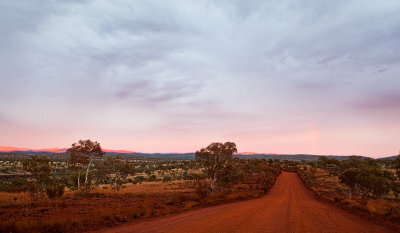 So step inside, kick back and enjoy Marble Bar in Western Australia. I even dug up a few old slides (yes I have been to Marble Bar twice!) for this special day. It is time for another travel story from the CAKE adventures of Rod Thomas, Casey Smith and yours truly. “There is no caravan park?” says Casey. So begins our stay in Marble Bar and the long overdue follow up to Cake Crew meets Camel Man. 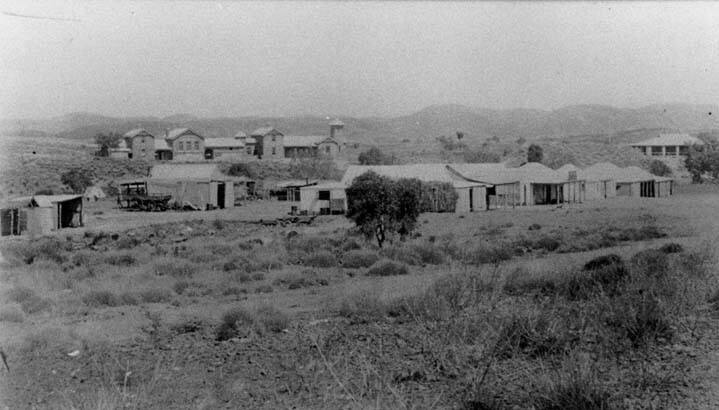 We have driven through the entire outback Western Australia mining town of Marble Bar. Took a few seconds. Met about 2 other people. Saw no caravan park. 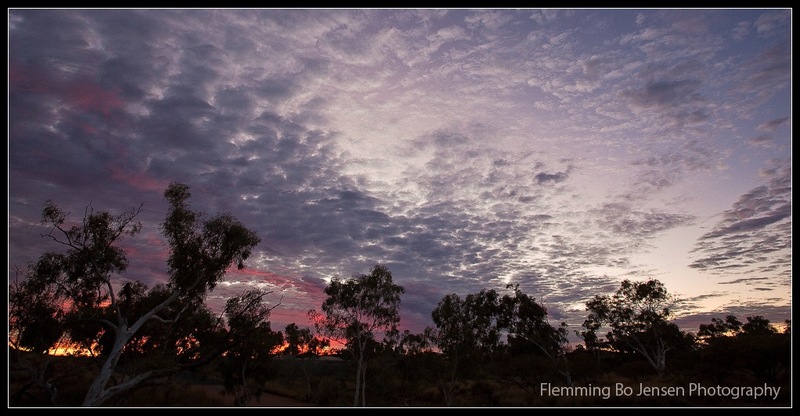 Will we be bush camping tonight under the Marble Bar sky as seen on the right? Karijini National Park in the beautiful Pilbara region of Western Australia is home to incredible landscapes and gorgeous gorges’ (trying to be funny here!) that are some of the most photographed sites in Western Australia. The gorges of Karijini are incredible, beautiful and tremendous fun to climb around in but for photography I am going against the grain and prefer the topside. The gorges are cramped, walled in, claustrophobic and below the horizon. Not my style, not my love. I seek dimensionless wide open spaces with a huge sky where I can dream myself into a magical universe with no limits! So here is a slice of Karijini but not quite as most would know it! Taking in a magical sunset after hiking through the bush and then a great 1 kilometre climb to the top of Mount Vigors with great Phil from RemTrek: highly recommended. The view from up here is extraordinary offering a stunning 360 unimpeded view of Karijini. We got great clouds and light on this day and I was high on the whole climb up and down and during the shooting. Magical experience. The climb down and walk through the bush in pitch black conditions lit only by torch light and a million stars is a truly otherworldly experience. 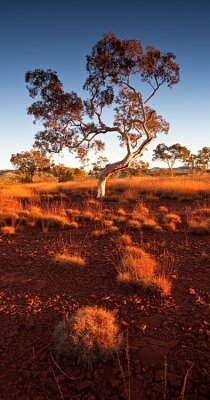 Karijini is also home to some very fine gum (eucalyptus) trees and I am happy to have captured this beauty bathed in the morning light. On our last day in Karijini a big cloud system moved in and dumped rain on us later in the day. I have already blogged about this brilliant morning here, and present another image of the same morning. I can never get enough of dramatic skies like this one and if you look closely there’s still a touch of rainbow left here. A short glimpse into my version of ‘the other’ Karijini. If you have been fortunate enough to visit, what is your favourite spot at Karijini National Park? I am completely taken aback by wide open desolate spaces. The bigger, wider, more open, more desolate the better and it really does take my breath away. It is hard to describe this feeling I get from it but it is the sense of space, the openness and having no boundaries at all. Once I have accumulated a collection large and good enough I hope to share this love through exhibitions and books dedicated to Wide Open Spaces. The image I wish to present today is from Namibia, from driving through the gravel desert in Namibia. Namibians has a nice expression for this – “Gramadulas” – basically meaning outback or middle of nowhere! You will not find a more barren vast area and I loved every second of this magnificent place. I am however somewhat curious if anyone but me likes this sort of stuff. Into the Wild does not really apply here as there is not a thing here and that is what makes it great. It is more appropriately Into The Nothingness! PS. I am posting slightly less and shorter than normal. Becoming a nomad and starting a new life is hard work and takes up a lot of time; leaving not as much time presently as I would like for blogging. Spare time needed!